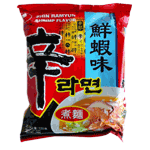 Nongshim's Shrimp seafood ramyun is the preferred choice of shrimp or prawn noodle lovers everywhere. It is made with the perfect blend of spices and vegetables, bringing the world the best-tasting noodle. The secret of the spicy and clean taste of Seafood Noodle lies in the soup sauce that is mixed with various seafood including shrimp, squid, mussel, and clam meat. Seafood Noodle is a product that will give you soft and deep taste of original seafood. With the addition of frozen-dried half moon fish cake and enriched seaweed flakes, you can enjoy much softer and more natural taste of seafood.